Seating There are 39 products. This square end table is just what you need to get your outdoor party started. All-weather resin wicker lends an elegant air, while the rust-proof aluminum frame ensures durability. Appealing textured fiberglass-resin table top provides visual interest as well as plenty of room for snacks and beverages. Gather around with this square outdoor end table at your side for heartwarming quality time. Durable and long-lasting aluminum frame has the attractive appearance of wood. Slat top adds an element of style. Decorate it with a plant in a trendsetting vase to complete the look. Elevate any outdoor living space with this square cocktail table. Comfy and casual, it's perfect for use inside or out. Resin wicker base and a rust-proof aluminum frame ensures carefree living, while the wood-look resin top provides stylish appeal. 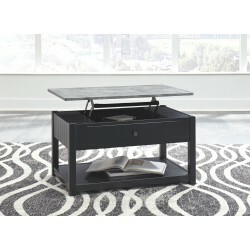 Pairing a faux marble top in gray with a brilliant black base, this lift top table makes a simply striking statement. A generously sized drawer adds to the form and functionality. Optional casters provide welcome flexibility. Be it for entertaining or everyday use, this outdoor square end table is a royally handy addition to your outdoor living space. Durable and rust proof, the dark brown-finished aluminum construction with a hint of distressing is made for season after season of enjoyment. Includes slat-style top and shelf for easy water drainage. This outdoor end table is a casual contemporary addition to your backyard retreat. Wood grain look of the porcelain top speaks of natural beauty. Designer base made of rust-proof aluminum keeps its appeal in all-weather conditions. Be it for entertaining or everyday use, this outdoor coffee table is a royally handy addition to your outdoor living space. Durable and rust proof, the dark brown-finished aluminum construction with a hint of distressing is made for season after season of enjoyment. Includes slat-style top and shelf for easy water drainage. This cocktail table is just what you need to get your outdoor party started. All-weather resin wicker lends an elegant air, while the rust-proof aluminum frame ensures durability. Appealing textured fiberglass-resin table top provides visual interest as well as plenty of room for snacks and beverages. Gather around this rectangular outdoor cocktail table for heartwarming quality time. Durable and long-lasting aluminum frame has the attractive appearance of wood. Slat top adds an element of style. Decorate it with trendsetting outdoor accessories or a serving tray for guests to complete the look. Elevate any outdoor living space with this multi-purpose rectangular table. Comfy and casual, it's perfect for use inside or out. Resin wicker base and a rust-resistant aluminum frame ensures carefree living, while the wood-look resin top provides stylish appeal. Sporting an easy-on-the-eyes look inspired by driftwood, this square end table elevates the art of indoor-outdoor living. Beautiful and durable enough for indoor and outdoor use, this high-style/low-maintenance table charms with X-leg farmhouse styling and wows with a thick porcelain table top that's a natural complement. Here it is. Your relaxation destination. This indoor/outdoor corner end table is the epitome of high-style, low-maintenance living. All-weather resin wicker lends an elegant air, while the rust-proof aluminum frame ensures durability. The table's tempered glass top makes for easy cleanup. This outdoor coffee table is a casual contemporary addition to your backyard retreat. Wood grain look of the porcelain top speaks of natural beauty. Designer base made of rust-proof aluminum keeps its appeal in all-weather conditions. This round outdoor coffee table invites you to gather round in style. An alfresco entertainment essential, this elegant outdoor table sports a pretty and practical lattice top that allows rainwater to drain quickly. Durable cast aluminum is crafted to weather the seasons beautifully. Sporting an easy-on-the-eyes look inspired by driftwood, this coffee table elevates the art of indoor-outdoor living. Beautiful and durable enough for indoor and outdoor use, this high-style/low-maintenance table charms with X-leg farmhouse styling and wows with a thick porcelain table top that's a natural complement. Swing your worries away with this gliding loveseat and matching table. Soft driftwood-hued resin wicker adds romance without the worry of splintering or cracking. Comfortable cushions are covered in all-weather Nuvella ® fabric so they'll look bright for years.